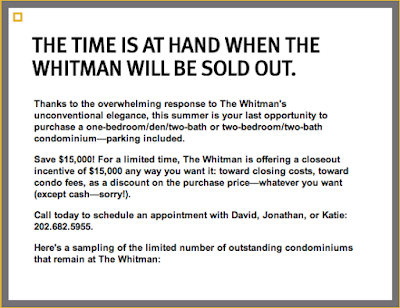 In case you missed it, I'm letting you know The Whitman is cutting prices by $15,000 on its remaining condos. Parking is included. Is the blog contact email address correct? Just tried to forward you an email, and had it bounce back with a "UNKNOWN_USER: No such user" error. Was trying to forward an email I received from McWilliams Ballard about The Whitman's "overwhelming response" $15,000 discount I received way back on June 14th. Two months of discounts and the units are still on the market. They're practically flying off the shelves! You're right, I'd entered the email address incorrectly. I've corrected the error. Well, remember that The Whitman is under massive pricing pressure by The Grant, which is undercutting The Whitman in quality and design for more money. The Whitman must be making it up in VOLUME!